In the last ten years, the speed and intensity with which intra-regional-level collaborations have expanded has been remarkable. The growth of regionalization is happening in all sectors, including higher education, and in all regions of the world, particularly Asia. The purpose of this chapter is to propose a conceptual framework and Functional, Organizational and Political Approaches (FOPA) model for analyzing the evolving phenomenon of the regionalization of higher education. The term regionalization of higher education has been chosen over the concepts of regionalism or regional integration to denote the significance of the “ization” or “process.” Regionalization is defined “as the process of building closer collaboration and alignment among higher education among education actors and systems in a designated area or framework, commonly called a region.” Regionalization of higher education is seen as a complementary process to internationalization. Three main approaches to the higher education regionalization process are proposed in the FOPA model: a functional approach which focuses on alignment of national policies and programs, and the development of regional frameworks; an organizational approach which refers to the myriad of actors engaged at national, regional, sub-regional, and international levels; and a political approach which speaks to the political will and financial support necessary to promote and support the regionalization process. These approaches are inter-related and simultaneously active, albeit at different levels of intensity. 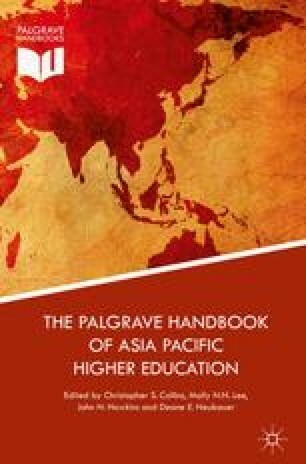 Examples from Asian are provided to illustrate and apply the three approaches and show the recent surge in Asian higher education regionalization. Key issues such as rationales, governance, benefits and risks, unintended consequences, language, engagement for all, and innovation are raised to stimulate further reflection and exploration on the complex process of higher education regionalization.